Kumar Tewari, partner at Katten Muchin Rosenman UK LLP and head of the London Banking team, focuses his practice on domestic and cross-border banking and debt finance matters. He counsels clients on a wide range of complex matters including, general banking matters; commercial real estate finance (leveraged investment and development finance); acquisition and leveraged finance; structured trade and project finance for infrastructure development; fund finance for limited and general partners; and secondary trading and non-performing loans. Kumar is considered to be an authority on complex intercreditor arrangements such as senior, mezzanine and preferred equity arrangements. Kumar also has significant experience in advising lenders and sponsors in highly regulated environments (both public and private entities) on a diverse range of legal matters, including regulatory, compliance and governance matters and guiding boards on UK directors duties. 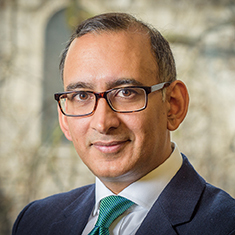 Prior to joining Katten, Kumar was a director and head of Legal at Lloyds Banking Group plc in London, where he played a significant leadership role and managed a UK-wide legal team responsible for a circa £40bn corporate and secured real estate finance book. Prior to Lloyds Bank, Kumar worked at Europe Arab Bank plc and before that he worked at Clifford Chance LLP in the leveraged finance team. Kumar is a frequent speaker on issues regarding UK Commercial Real Estate matters, he is also a technical trainer and has played a significant role in helping to develop the Loan Market Association's Intercreditor Agreement model form. Shown below is a selection of Kumar’s engagements.